In short - yes. Weight gain is not purely about the aesthetics - it can be seriously bad for your health. Menopause can cause women to gain weight that is harder to shift for a variety of reasons, and some women can feel down about their appearance. However, even if you are not feeling negative about your own body image, being overweight can lead to a wide range of physiological complications. Hormonal shifts. During menopause, the hormonal changes mean that weight shifts from hips and thighs and starts collecting around the abdomen. Changes in body composition. Muscle mass reduces with age, while fat deposits increase. This has an effect on the rate at which calories are burned, so older women typically need fewer of them to maintain the same weight. Family inheritance. Genetic factors and family history can also play a role. Some women are more susceptible to gaining weight around the abdomen (visceral fat), which is linked to a higher risk of diabetes and cardiovascular disease. Life events. Stress arising from other menopause symptoms and external factors (children leaving, death of a spouse or parent) can also lead to lifestyle changes that contribute to menopausal weight gain. Psychological consequences. Many women who are overweight can feel judged and self-conscious of being in public or of partaking in social activities like family BBQs or beach trips. The negative self-image that some women have after gaining menopausal weight can lead to feelings of anxiety or depression, which can end up affecting daily life. High blood pressure. High blood pressure can occur in overweight individuals because the heart needs to pump harder to supply blood to all cells, especially with the added weight the body must carry around. Excess fat also has a negative impact on kidneys, which help regulate blood pressure. Diabetes. Cells change in response to too much weight, and this can make them resistant to the hormone insulin. Insulin works by carrying sugar from blood to the cells, but when a person is insulin resistant, blood sugar cannot be taken up by the cells, and this results in high blood sugar. Additionally, insulin-producing cells are working extra hard to try to keep blood sugar normal, and this may cause their gradual failure. Heart disease. When a blood vessel that carries blood to the heart becomes hard and narrow, this results in keeping the heart from getting all the necessary blood. 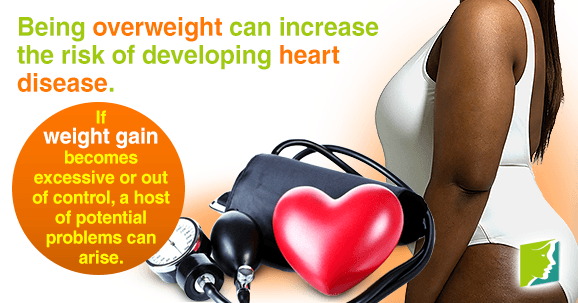 Being overweight can increase the risk of developing heart disease because the health problems it creates - high blood pressure, high cholesterol, and high blood sugar - are known to be direct triggers of heart disease. Menopausal weight gain is common, but it doesn't have to be inevitable. A healthy lifestyle should reduce the risk of gaining too much weight and developing the aforementioned conditions. This should include being active and eating a balanced diet. However, if you are doing this and still finding it hard to lose weight, then a doctor's advice should be sought, as the weight gain could be a symptom of another underlying issue.